It was Monday morning when George picked me up from Pireaus harbour and after arranging some last minutes things that George had to do we started driving towards north Greece, Pilio region, where our kayaking trip starts. After several hours of driving we’ve just managed to arrive in Agios Georgios village just before sunset. The weather was dead calm, with just a few days before the full moon we grabed the oportunity to enjoy the short crossing (2 nautical miles) during the night towards Skiathos island. We’ve unloaded our NDK explorers from George’s Karitek roof rack and start loading the boats. Once we finish with the crossing we head to Lalaria beach (another 6.5 nautical miles), a superb beach with no access by road in the island of Skiathos. It is definitely one of the best beaches I’ve ever been, occupied by hundreds of birds. 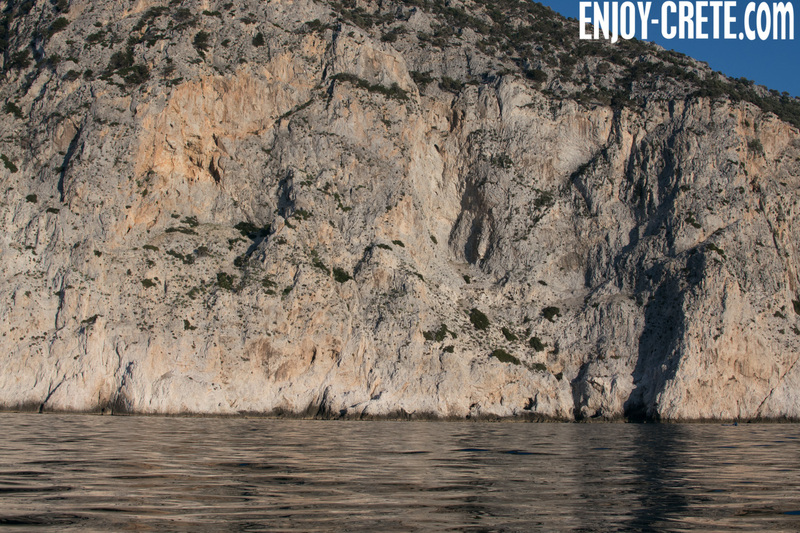 Sea kayaking in Greece during the winter is simply outstanding. You barely see any boat, all beaches are empty and the weather in general is like a good summer day in the UK. 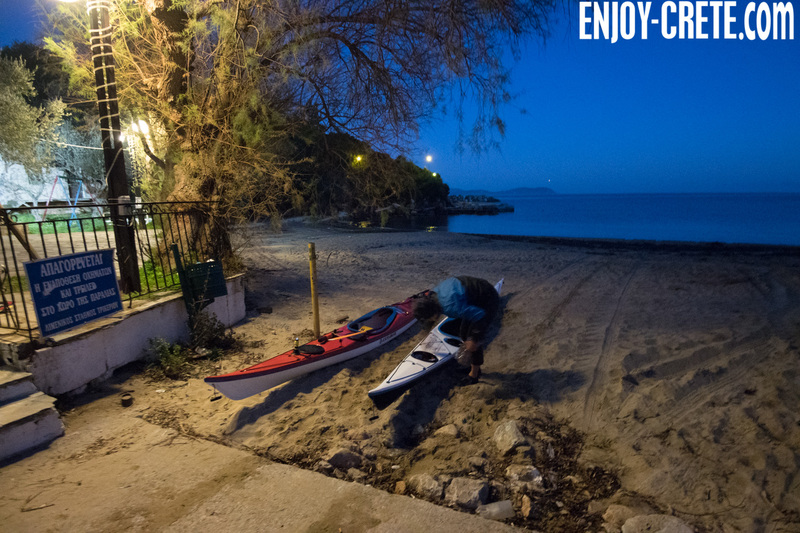 George and I strongly believe that sea kayaking in Greece during the winter is a must for kayakers looking to escape during the cold winter in northern countries. There are plenty of options for multi day trips from the south and the island of Crete to the north in Sporades and of course the rest of the islands in Aegean sea & Dodecanese archipelago in eastern Greece. Back to the trip…after spending a lovely night in Lalaria beach we decided to do the north part of Sporades islands first which are more exposed to winds & waves and offer less options for landing. From Lalaria beach we did the crossing (5.5 nautical miles) to Skopelos island with a nice force 3-4 wind coming on our side and then we moved on paddling the whole north part of Skopelos until we arrived to the town. 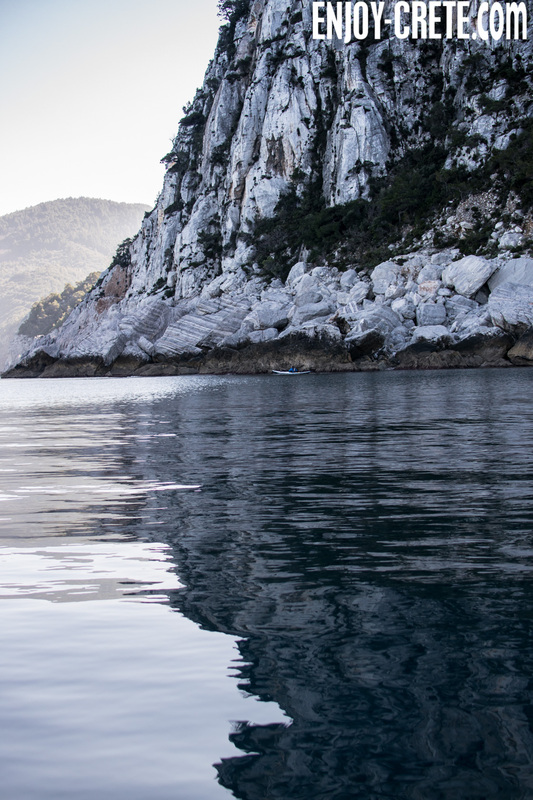 We refilled some supplies (mainly water) and started paddling towards Alonissos island. There is a short crossing of 2.5 nautical miles to Alonissos with some superb islets between like the Agios Georgios islet (see photo below). 19 nautical miles since the crossing from Skiathos we arrived just before it gets dark to our camp spot, a tiny small beach covering more or less near 24-25 nautical miles that day. Can you spot the kayak in the photo? In the morning we started paddling along a nice swell coming from the north west the last part of Alonissos which is the most impressive. 12 nautical miles of no landing with vertical high cliffs (limestone) and an amazing view to the first and only marine sea part of Greece at the time being. Just before the end of a cape a dolphin appeared just a meter from my kayak, what an experience! Such a beautiful animal! Unfortunately I didn’t had the time to get a photo since my non waterproof camera was in a dry case inside the cockpit. By the time I took it off it had escaped. The view to Kira Panagia island after we started turnign to the north-east part of Alonissos is amazing. Mountainous and uninhabited, this island has a smooth surface and is spread with macchia vegetation, pistacias and kermes oaks. Due to been a marine park, overnight stay is not permitted. 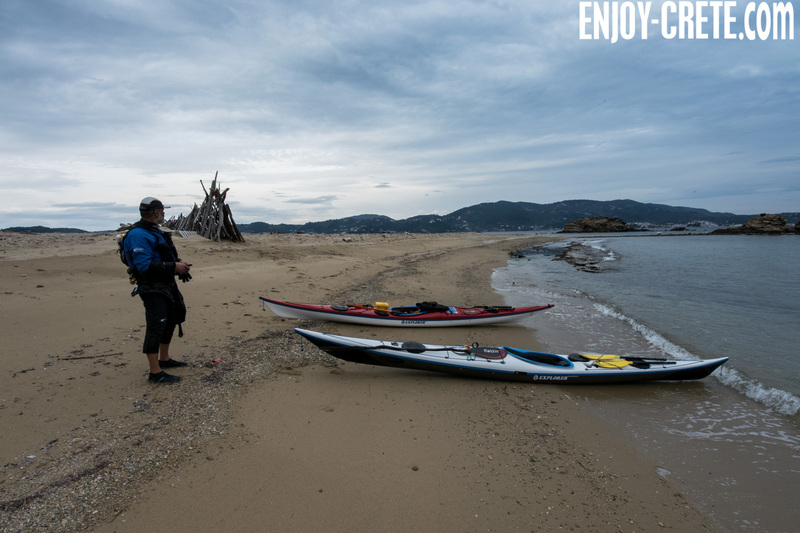 On top of that we had a not very pleasant weather forecast for the upcoming days so we decided to keep paddling and camp somewhere in the south part of Alonissos covering more or less more than 20 nautical miles that day too. The National Marine Park of Alonissos and Northern Sporades was the first marine park established in Greece and is currently the largest marine protected area in Europe. Founded in 2003 and funded within the framework of the “Environment and Sustainable Development” operational program, its management body is responsible for the preparation and implementation of the management plan relative to the Marine Park. The efforts to protect this area began in the early 1970s. In 1986, the Prefecture of Magnesia signed the first resolution aiming to the protection of the Mediterranean monk seal and its natural habitat. These efforts were followed by a series of ministerial decisions on the protection of the local nature reserve. In 1992, the area was finally declared a “National Marine Park”. The night found us camping in Chrisi Milia beach, the first beach on our trip with a road access. It was very quiet however, as the population of the island during the winter is very little. Access to the road was a good chance to explore the biggest city of Alonissos, named Patitiri. After half an hour walking and we were in the town. It is an extremely quiet town during the winter and after a few attempts to find a nice coffee shop for a break we found a good one! Next morning and after trying without much success to dry out tents from the humid (it was so wet like was raining all night) we paddled the whole coast of south Alonissos and Skopelos until we setup our camp an hour before it gets dark. Facing pure west, we had an amazing sunset and enough time to get some rest. Next and the final day of our trip had the largest crossing (7.2 nautical miles) from Skopelos until the small islet of Tsougria and and then just a few to Skiathos. We had a nice force 4 wind and about 1 meter waves on our side making pleasant the crossing and less boring. A few more miles until the end of the south part of Skiathos and ready for the final short crossing to Agios Georgios, where we started. Lunch stop after the crossing to Skiathos from Skopelos. 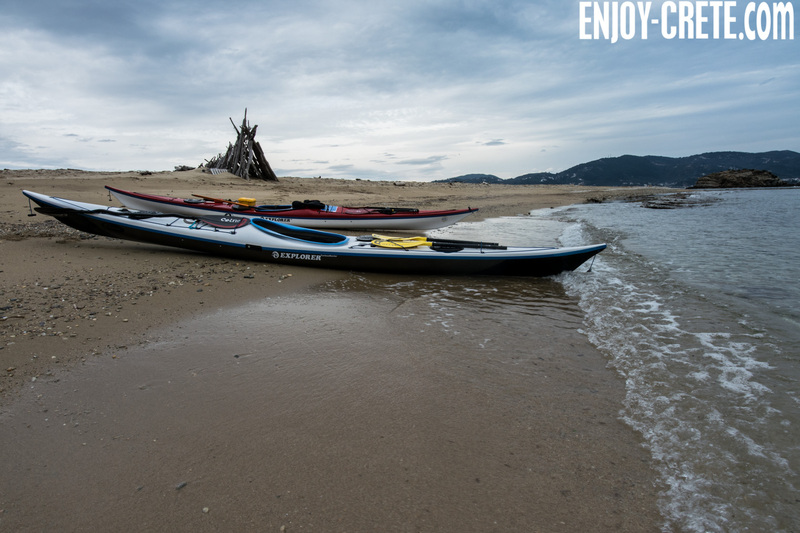 For those thinking of doing the trip bare in mind that there is no company where you can rent sea kayaks so you will need either to join a guided expedition or travel with you kayak. Toll fees from Athens until the starting point are ridiculous expensive (25 or so euros one way). Also driving will take you more or less about 6 hours as the last 100km are narrow and windy roads so try to start early or overnight in Agios Georgios. 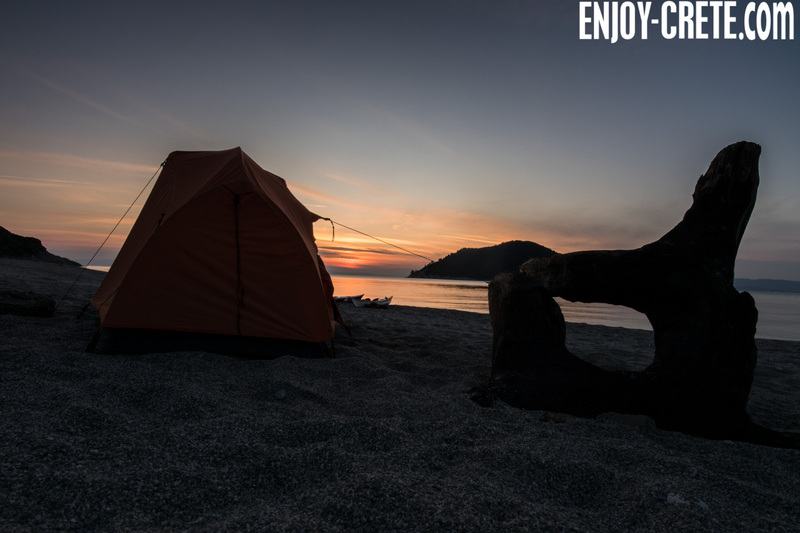 During the winter you can just camp on the beach in Agios Georgios. During the summer months from what I’ve seen there are a few options for accommodation but be sure to call before as the village is tiny and might be fully booked. 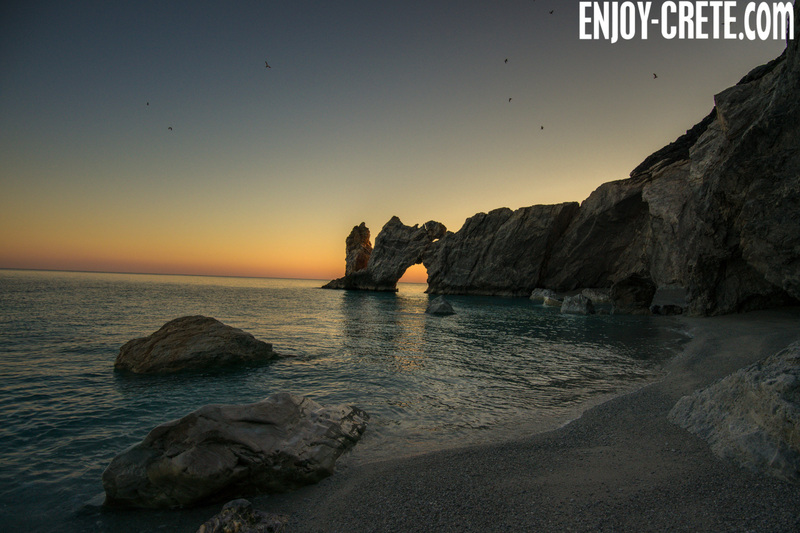 For those that interesting in a hassle free trip why not join us in a guided expedition in Sporades? All you need is to be comfortable in sea state 3 and been able to paddle without a stop for about 5.5 miles (~12km) due to the crossing from Alonissos to Skopelos.